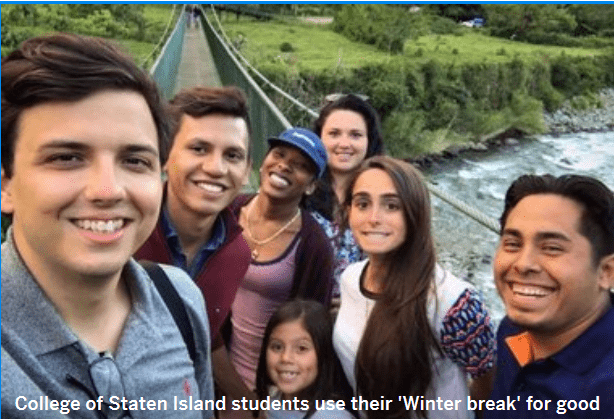 STATEN ISLAND ADVANCE — While most college kids spend winter break binging the latest Netflix series, six students from the College of Staten Island gave up their vacation to fly across the globe and volunteer in Costa Rica. Pablo Llerena, Dea Aga, Blerim Cukovic, Xena Flowers, Shiqirije Salaj and Jorge Villatoro partnered with the volunteer organization UBelong to help with reconstruction projects in Pitahaya, Cartago, Costa Rica. From Jan. 6 to Jan. 30, the CSI group reconstructed the Hogar de baik Costa Rica (Home of the Children Baik in Costa Rica) orphanage. Although the group originally signed up for manual labor — they also cared for the children of the orphanage, ranging in age from toddlers to 7 years old. Cukovic said leaving the kids was tough — but the lessons learned from them will stay with him forever. The students stayed with a host family in the developing country. 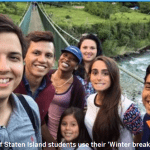 They walked through the towns, worked full-time, seven-hour shifts during the week at the orphanage and “lived life as Costa Ricans” throughout their stay. The three-week trip marked the first time anyone in the group had been to Costa Rica. They say the experience opened their eyes to the world and humbled them on a personal level. Their trip was not free of complication: On their first night, the town where the students lived experienced a black out. Shortly after, ongoing pipe construction left Costa Ricans with no water for a day. Sure, the idea of “giving back” via helping a community in need warms their hearts, but the group went to Costa Rica in hopes of doing some personal soul searching as well. This article by Victoria Priola was first published February 8, 2017 on www.silive.com. It is reprinted here with permission.